Boston Community Runners prepare for the Boston Marathon and Half. Boston Community Runners made the most of home advantage. Competing at the Boston Marathon, Half Marathon and Fun Run, a total of 29 club members took part. Taking on the full 26-plus-mile distance, Rob Cross was the first back, clocking 3:23.15 in his first ever marathon. John Burton (3:35.24), Dan Clark (3:46.40) and Nathan Saw (3:46.37) followed him across the line, with Simon Pickwell (4:11.26), Tanya Knight (4:22.44) and Jayne Wallis - tackling her 21st marathon - (4:38.14) also going the distance. In the half marathon the PB times kept coming. Kelvin Clements was the first club runner to finish in his first half marathon, clocking 1:33.05. 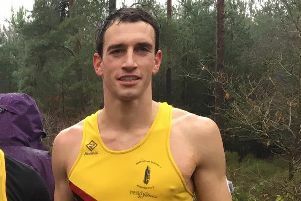 Andy Butler knocked three minutes off his time from last year (1:44.43), ahead of Steve Roberts (1:44.54), Matt Tunnard (2:00.06 PB), Bret Bretton (2:00.28), Michael Corney (2:07.00) and Neil Goodwin (2:08.20 PB). Emma Cook was the first club lady back as she now tapers ready for the London Marathon, but still managing a PB time of 2:10.02 as she crossed the line. More personal best times followed for both Dianne Houghton and Lesley Buswell (both 2:2.46), just ahead of Fran Mills (2:14.54). 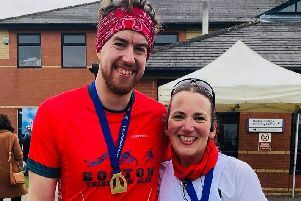 Other half marathon entrants were Sharon English (2:19.06 )B), Jon Carpenter (2:19.12), Jayne Clements (2:19.12 PB), Graham English (2:24.34 PB), Jackie Hallett (2:24.36), Claire Teesdale (2:25.10), Sarah Burton (2:27.17), Debbie Petley (2:21.21 PB), Samantha Cross (2:31.31 PB), Kerry McCrainor (2:38.51) and Carmen Clark (2:59.25). Boston Community Runners offer track sessions on a Tuesday evening at the Princess Royal Sports Arena (7pm). They also hold social runs on Thursdays from the Peter Paine centre, Rosebery Avenue (7pm).